PAD14-10G Color: Green, Compatibility: Compatible with Arches Features: -For use on a 14' Jumpking Combo Unit or Bazoongi JumpPod Unit with 7'' springs.-Pad has holes to accommodate unique G4 enclosure poles and big T connector features.-Specifically compatible with model #s BZJP1406, JP1414C, and JKCB1405. Color/Finish: -Two color options. 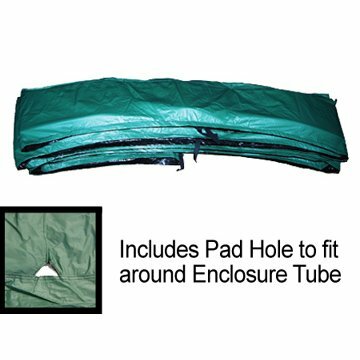 Specifications: -Composed of 10 oz vinyl top coating and polyethylene bottom lining. Dimensions: -Pad is 10'' wide.